Despite the strong growth of digital media in India, the traditional formats of television and print still account for the largest portion of total media ad expenditures. eMarketer’s recently updated forecasts estimate TV ad spending will account for 39.3% of total media ad outlays this year, with newspapers making up 33.9%. New ad revenue figures from KPMG and the Federation of Indian Chambers of Commerce (FICCI) roughly align with those estimates. Research from the two entities found that print advertising generated INR201.3 billion ($3.0 billion) in revenues in 2016, while TV was responsible for INR201.2 billion ($3.0 billion). 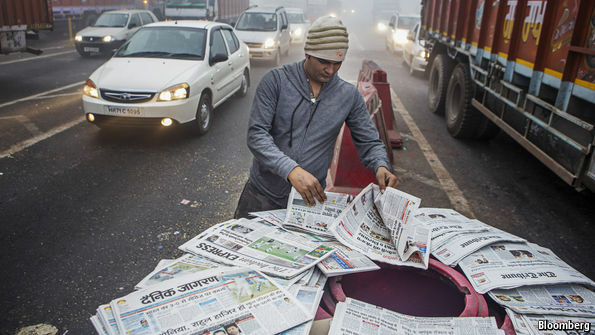 India remains somewhat unusual in that print revenues continues to grow, with newspapers specifically still serving as an effective way for advertisers to reach a significant audience. The research from KPMG/FICCI found that newspapers generated INR289.9 billion ($4.3 billion) in overall revenues—including advertising and circulation—in 2016, while magazine revenues declined, hitting INR13.4 billion ($199.5 million) last year. KPMG/FICCI reported that newspaper growth was really coming from papers published in Hindi and in other local languages and dialects—generally referred to collectively as “vernacular” papers. According to the research, ad revenues for English-language papers grew 3.5% in 2016, compared with 7.1% for Hindi-language papers and 8.7% for those in regional languages. English is really only prevalent in India’s largest cities, leaving readers in smaller cities and rural areas with an appetite for content in their local languages. Unlike in markets with a more developed digital ecosystem, newspaper revenue streams in India have not yet faced a serious challenge from digital content channels. However, the rise of digital is inevitable. eMarketer estimates the annual growth rate in the number of smartphone users in India will remain in double digits through 2019, dipping to 9.8% in 2020. By then, 28.8% of the country’s total population is expected to own and use a smartphone at least once per month. KPMG/FICCI found that the continued adoption of internet-enabled devices (mostly smartphones), as well as the the falling price of 4G data in an increasingly competitive mobile service market, has left newspaper publishers understandably worried about the threat digital media will inevitably present to their bottom lines. The writer of the article is Rahul Chadha.